Will 2017 bring more civility to America? Oh hell no! If you think the election of Donald Trump will end the decades of Liberal control of the culture, you are delusional. And that’s why we will continue to see Liberal stupidity on display, as was capture on video at Walmart. As the saying goes, “You can take the thug out of the ‘hood, but you can’t take the hood out of the thug. As we exit the Era of Obama, America finds itself chocked full of thugs and thug wannabes. These ignoramuses have no idea how to resolve differences without going straight up jungle. Merry fricking Christmas, according to KMOV. 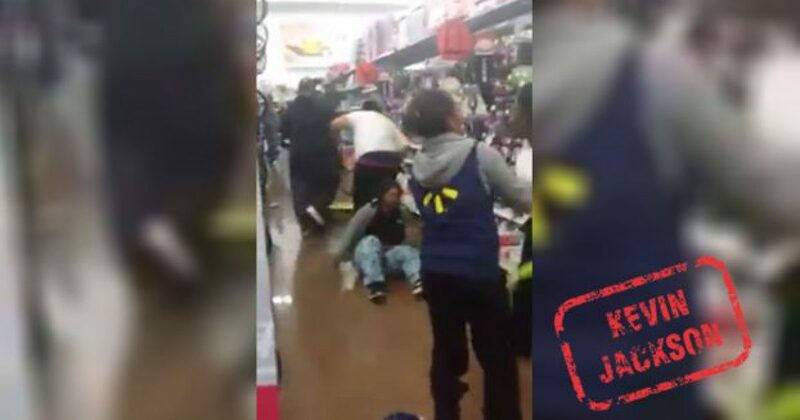 These Walmart shoppers brawl in a Walmart in Louisville, Kentucky. They fought in the bicycle aisle, over nothing. A harsh look, perhaps, or a misinterpreted statement. It takes little these days for Leftists to escalate to physical violence. I’m actually somebody didn’t get shot. Look at what happened on Black Friday of this year. At least six people were shot across the country during Black Friday sales, including a Walmart customer who died in a fight over a parking space. Four separate shootings — at a New Jersey Macy’s, two Tennessee malls and a Nevada Walmart — killed two people and wounded four more. All the attacks happened outside of the stores as holiday shoppers inside loaded up on door busters and deals. The store suffered no real damage, and Walmart has these types of incidents factored into the cost of goods. One can only imagine what the actual cost of goods would be without Liberals. Stores wouldn’t have to worry about looting, flash mobs, shoplifters, or the lone Liberal troublemaker. America could go back to enjoying the shopping experience, rather than being victims of it. And we could avoid the fights. It’s easy to see why the new economy will be built around cyber shopping. You might get your credit card stolen, but at least you won’t get beaten up.